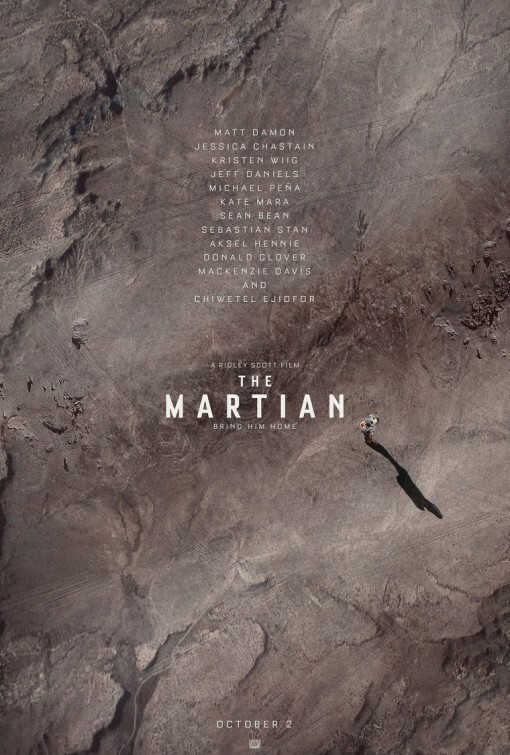 Leading up to the release of Ridley Scott’s film adaptation of Andy Weir’s best-selling science-fiction thriller, “The Martian”, there had been comments about how it was similar to 2013’s “Gravity” and last year’s “Interstellar”. 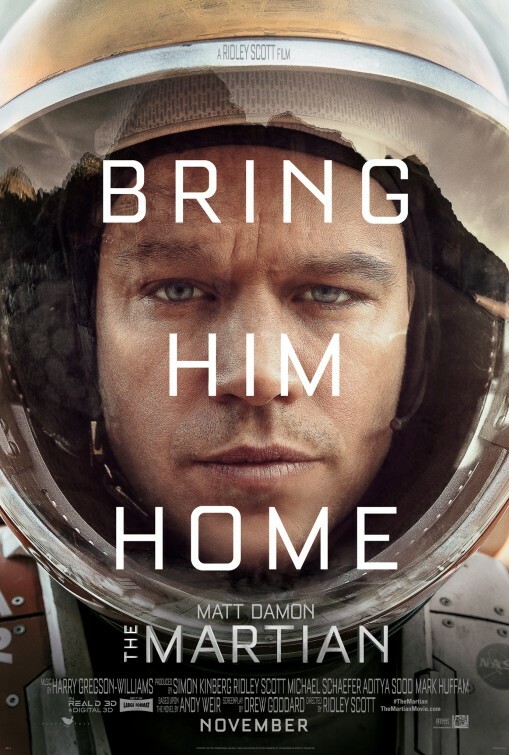 The former because Matt Damon is lost in space again and the latter because the protagonist of “The Martian” is unintentionally left behind on Mars by his crew. Finding similarities in new films or comparing them to others is inevitable, but nevertheless annoying. Let’s just take the film as it is. In this case, here is a beautifully photographed, crowd-pleaser of a science fiction film with an emphasis on science, unexpected humor and disco music. But, if we had to lob “The Martian” into this ‘Lost in Space’ subgenre, it’s a worthy entry, which some may consider a comeback for Ridley Scott, the 77 year-old director who last year gave us the woefully wretched Biblical flop, “Exodus: Gods and Kings”. Scott’s last science fiction film was “Prometheus” from 2012, another beautifully photographed film which has its equal share of champions and fervent critics. Some are saying his last great film was “2007’s “American Gangster”and they may be right. For the record, I’ll admit I’m somewhat of a Ridley Scott apologist and usually find something in his films that’ll prevent me from trashing it (except the aforementioned “Exodus”) , even “The Counselor” warrants at least another viewing. “The Martian” proves that with a simple, uncomplicated concept and a solid screenplay, Scott is able to really fire all cylinders and deliver a satisfying sci-fi yarn. When a violent storm on Mars separates astronaut/botanist, Mark Watney (Matt Damon) from his fellow crew members of the Ares III, he is presumed dead and stranded as his ship is forced to evacuate and return to Earth. Commander Lewis (Jessica Chastain) regretfully reports to Houston that Watney has died, which sends NASA head Teddy Sanders (Jeff Daniels), spokesperson Annie Montrose (Kristen Wiig), mission director Vincent Kapoor (Chiwetel Ejiofor) and crew supervisor Mitch Henderson (Sean Bean), scrambling to figure out a way to rescue Watney and save the face of NASA from a PR nightmare. Meanwhile, Watney wakes up to a wound that he learns miraculously kept him alive and soon realizes that he’ll have to rely on his botany skills and upbeat spirit to survive as he uses every resource available as well as with his imagination in order to contact Earth. That’s the gist of the story, which is adapted by screenwriter Drew Goddard (“World War Z” and “Cabin in the Woods”) and it seems simple enough, but there are important nuances both in the movie’s tone and in the performances that elevate the material to something beyond a ‘lost and rescue’ concept. Watney immediately takes inventory of his oxygen, food and water and determines just how many days they will last him, keeping in mind how long it will take the next expedition from Earth to return. He creates a potato farm out of Mars soil and the his and crew’s recycled manure. It stinks but it works. He has working transportation and even finds a way to keep warm in it by digging up a radioactive device. As resourceful as Watney is, he’s relying on the minds back home to be even more creative. With NASA at a loss, help is found in various forms. There’s JPL (Jet Propulsion Laboratory) director Bruce Ng (Benedict Wong), aerodynamic astronomer, Rich Parnell (a quirky Donald Glover) and even another country, in the form of China National Space Agency – all of whom provide NASA with endless hours of work, unprecedented ideas and a needed lifeline, respectively. Saving Watney becomes a collaborative effort, that is ultimately reliant on Commander Lewis and her crew, Rick Martinez (Michael Pena), Beth Johansen (Kate Mara), Chris (Sebastian Stan) and Alex (Aksel Hennie), making decisions that could cost them their lives. Goddard taps into the story’s most intriguing element which is the fact that Mars becomes this stranded man’s home for days, months even. He’s the first and only man on Mars. When he looks to the sky, he doesn’t see Earth’s moon -he doesn’t even see Earth. Imagine that. Just let that sink. The concept alone is staggering and considering our protagonist’s situation, this could’ve been an overwhelmingly dire film. Thankfully, novelist Andy Weir has created quite a character in Mark Watney and we get to see a little of him in this movie. I say ‘a little’ because, well, a book will always be more descriptive and get into the head of a character more than a movie adaptation can. Still, Scott and Damon give us a good idea of the Watney we can find in Weir’s pages. It helps that he is an engaging and sympathetic character, who is charismatic and open – that has a lot to do with the way Damon portrays him – but we notice this in the video diaries Watney maintains. They serve both himself and (of course) the movie’s audience. It’s a helpful device for Watney, but mostly a handy storytelling device, providing us with personal time that reveals this character’s frustration, fears and sense of humor, as he faces each challenge amid the reality of his situation. Granted, watching Watney crack jokes while figuring out a livable situation for himself probably won’t go over well with everyone, but I found it refreshing. It may be a coping mechanism, but it works. He still shows a frightened side and range of understandable emotions – like when his homemade potato farm is destroyed – but I found it easy to go along with Watney because of his perseverance, humor and vulnerability. No doubt, it’s also because Matt Damon has become one of the most believable and likeable actors to watch on-screen. The movie’s tension is tightly wound, especially as we witness Watney’s setbacks and the failures back on Earth. There are moments of unbelievable resolve, such as when we hear Watney record how he’s prepared to die on Mars if he has to, knowing how important the work he’s done on the planet has been. It’s easy to believe because of the amount of time we’ve spent with Watney, witnessing his resolve and, of course, because of Damon’s convincing portrayal. What I found myself appreciating the most about “The Martian” is how we’re given a movie with a story that finds the whole world coming together to root for the return of one man on Mars. It doesn’t matter what country he’s from, what his sexual orientation is or what political party he’s with. We get the idea that every country is invested, anxiously awaiting what will happen to Watney – and it may seem very Hollywood or a concept that’s hard to comprehend, but nevertheless something you hope would happen in real life. Scott handles the back-and-forth of plots with confidence, never dragging or losing focus as the stakes build around an ensemble of characters. He’s great with his actors, allowing each one to contribute as Goddard’s script allows. Damon has to carry “The Martian” obviously, but it truly feels like everyone has something to offer – although, Wiig is a casualty, given a non-character who barely contributes to the overall plot. Regardless, seeing this much talent in a story that requires intelligent thought and emotion weight over any action sequences or over-dramatic lines is a welcome change. 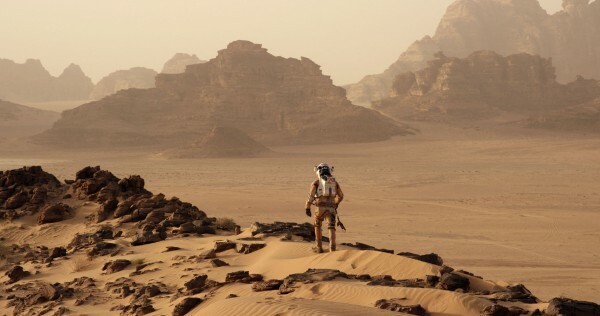 The visual and design aspects of “The Martian” definitely stand out. 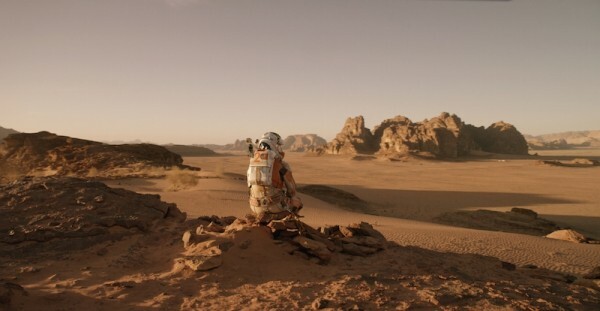 Much of the film was shot in Wadi Run in Jordan, which has been used as landscapes in other Mars films, like “Red Planet” and “Mission to Mars” (both released in 2000), a location that has a convincing otherworldly feel to it. The geography of Mars feels like an actual place, albeit one that is appropriately haunted by crimson echoes of solitude and abandonment. The crew’s spacesuits and spacecraft are unique (something that’s a challenge considering what we’ve seen in other films over the years) and detailed, created for optimum functionality and purpose. The 3D Scott incorporates is more than just a cosmetic slap-on. It may not have been filmed in 3D like “Prometheus”, but there is a good use of depth in the vistas of Mars and in Watney’s video footage, otherwise it effect is kind of lost on the story that unfolds on Earth. The sound and vision of “The Martian” is memorable and striking, but what is most welcome is how Scott tones down his style and allows viewers to come at the material honestly, without any whiz-bang effects to wow the audience. It’s a movie that deftly balances the right tone, which is not easy when incorporating Donna Summer’s “Hot Stuff” and ABBA’s “Waterloo” with the spirit of NASA ingenuity and the understandable peril you’d expect from a survival film. The success of “The Martian” has just as much to do with Scott balancing it all so well as it does Damon reminding us why he’s a movie star.